The cabin is located 5 miles North of Garrison, Minnesota. 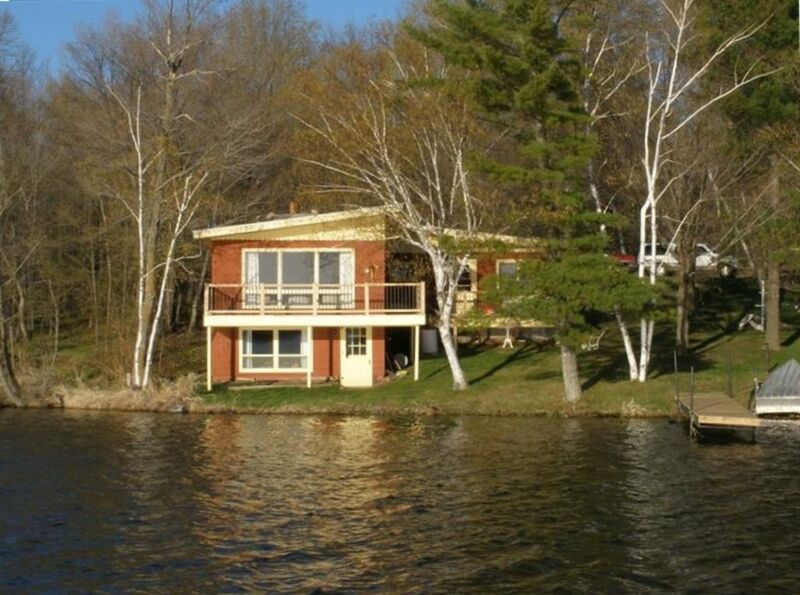 It is tucked in off the dirt road and is 15 feet from the lake, while on the front deck it appears to be over the water. The lake is about 660 acres. It is a deep spring fed lake that is very clean. it has good numbers of Large mouth bass, Crappies, Walleyes, and some very nice sized Northern Pike. We have a charcoal grill and a fire pit for evening bon fires. We provide the fuel for both. There is a public boat landing at the other end of the lake and a dock for the kids to fish off, and to tie your boat if you want to bring one along. We furnish a 14' Lund fishing boat a canoe, and a paddle boat for your enjoyment. . There is a public landing for Mille Lac Lake 2 1/2 miles from the cabin. During ice fishing season, we have a heated, four hole, ice fishing house for you to use at no extra charge. We are located 20 miles from Brainerd 20 miles from Aitkin 15 miles from the casino for a evening of fun and a great buffet dinner. Thanks for considering us. Great place nice updates but still has that cabin feel and experience. Do not think you can find a place any closer to the water! Lakefront cabin was as advertised. Clean, quiet, comfortable. Great fireplace. No problems whatsoever. Fantastic view of the lake from spacious living room. Close to everything you need in Garrison MN. The property was very well kept and clean. We had an enjoyable experience with a lot of peace and relaxation. Everything was beautiful, the lake, the cabin, the secludedness. It seems like we always wanted to do something, like power wash the outside of the cabin and blow leaves. But it was great and enough to do. The other couple were fishermen and they had a good time as well and even caught a walleye and some northern. I loved listening to the bullfrogs and loons here. We caught a ton of bass off of the dock. There was a muskrat that we named "Manny" who was building a nest on the shore. It's a little weedy to swim from the dock so my kids went swimming in the middle of the lake off of the paddle boat. The store wasn't too far away so we could make last minute trips before dinner if needed. My husband brought his fishing boat so we made the trip over to the boat launch. The launch is close as the crow flies but a 15 minute drive away. No big deal though. We met Dale the owner....he is great and gave us some pointers on where to fish. The husband caught good sized sunnies, a few pike, and lots of bass. We had the air conditioning on for most of our stay because it was really hot out. The lower level gets pretty cold when the ac is on. We probably should have called Dale to ask how to regulate it but didn't want to bother him. We had a great time and will be going back again. Maybe for ice fishing? Thanks Dale! Very warm and cozy place. The owner provided firewood for the large stone fireplace in the living room which we enjoyed very much. 25.00 Propane for Fish House fee only during winter season. 100.00 Pet fee for Summer season (7+ night stay). 50.00 Pet fee for any other season (2-6 night stay).